Ben Faustino was born in August 20, 1988 in Manila Philippines. He is the youngest of two boys in their family. He moved to Florida with his parents when he was 16. He started dancing at his senior year, with the hip hop dance team at his high school and got awarded as the "most improved dancer". 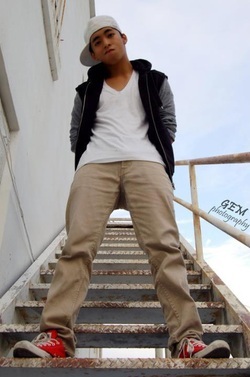 At the age of 18, he started to take dance more seriously and started taking classes at Seans dance factory. From there he learned how to freestyle, pop, lock, house, and breakdance. He became a professional dancer at the age of 19. Soon, he left Seans dance factory and trained with Brian Abadia and took workshops from Nick Wilson, Jaffar Smith, Jun Quemado, Gigi Torres, Candace Brown and Elm Boogie. Now, he's starting to teach at Olympic Heights High School and U4ria dance studio as a guest instructor. And one day he wishes that he will inspire many people by his passion and love for dancing.